With eight measurement ranges from 10 to 250 mm, a choice of red, blue or IR source versions and linearity to better than 0.05% FS, Riftek’s new 2D laser scanner combines with a comprehensive software development kit and service protocol to facilitate integration into high precision linear measurement tasks that include surface profile, displacement, dimensions, object recognition, flatness, volume, 3D model construction and more. Available with full support from measurement specialists Ixthus Instrumentation, the smart RF627 series ARM-based laser scanner offers selectable sampling rates up to 6800 profiles/sec with fast inputs and outputs for event and multiple scanner synchronisation. The RF627 series employs the optical triangulation principle to provide a base distance and a generous measurement range with a wide field of view. The new design has allowed a marked increase of twice the accuracy and four times the speed over previous Riftek 2D scanners for improved measurement precision and throughput. 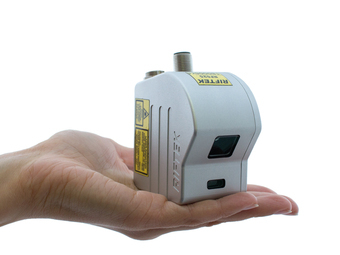 Optional red, blue and IR laser sources allow measurement on reflective materials, high temperature objects, organic materials and more. Multiple scanners with different wavelengths can also be supplied, offering the possibility to combine various materials in one measurement system. Ethernet connection and a web-browser interface facilitates set-up and programming whilst an integral reset button and LED status on the housing makes installation and troubleshooting straightforward. Synchronisation over RS422 covers three inputs and one output with a single hardware input for laser on/off. The laser scanner is supported with a comprehensive user manual and along with the free-of-charge software development kit, including examples for Windows, Linux, .NET, MatLab, and LabView®, is available from Ixthus Instrumentation. The RF627 series has been designed as a new modular platform for rapid application development and updating of 2D scanners and 3D snapshot scanners. Over the coming months variants will be offered with longer working ranges, higher scan rates and video camera/encoder integration. Furthermore, customised models for weld seam inspection, 3D model measurement, tunnel scanning and more will be offered with compatible ready-to-run software for fast integration in the customer’s application. Ixthus Instrumentation is the exclusive UK distributor for Belarus-based Riftek and provides sales and technical support across its comprehensive range of optoelectronic 2D and 3D laser measurement components and systems. Ixthus works closely with other leading suppliers of non-contact sensing technologies as well as sensors for force, torque and vibration - providing measurement application solutions across aerospace, medical, process, packaging, metal industries and more.